We’d love your help. Let us know what’s wrong with this preview of The Spinner of Dreams by K.A. Reynolds. Cursed at birth by the devious Fate Spinner, Annalise has always lived a solitary life with her loving parents. She does her best to ignore the cruel townsfolk of her desolate town—but the black mark on her hand won’t be ignored. Not when the monster living within it, which seems to have an agenda of its Annalise Meriwether—though kind, smart, and curious—is terribly lonely. Not when the monster living within it, which seems to have an agenda of its own, grows more unpredictable each day. To ask other readers questions about The Spinner of Dreams, please sign up. It’s been really difficult to write this review, because I am so head over heels in love with this book that I keep getting a bit incoherent in my gushing. 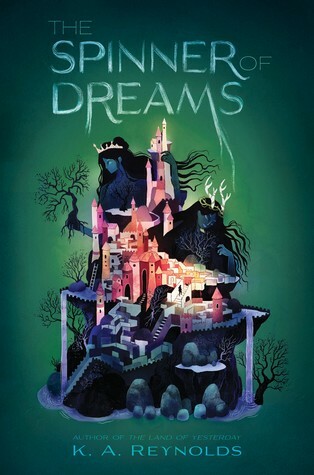 This is a magical fantasy tale that reads like a mash up of classic childrens’ literature and traditional fairy tales – and it has amazing #ownvoices anxiety, PTSD, and panic disorder rep. It would be beautiful if it were just a tale of friendship through weird magical peril, but to have a main character who suffers intrusive thoughts and panic attacks is just incredible. Personally, I didn’t start having panic attacks until I was an adult, but if I had been a kid who had them, this book would have meant the world to me back then – and it does now. Annalise lives in a town where everyone hates her, because of her curse. She was cursed at birth by the Fate Spinner, the evil half of a pair of royal twins who rule over people’s lives, and now everything goes wrong for her and the people around her. Despite the fact that she hates her giant hand, with its strange birthmark, she hasn’t allowed this to make her miserable or cruel to others – instead, she is brave, optimistic, and kind. She has developed coping mechanisms which comfort her, and it was fab to see these included (her repetitive hair-stroking resonated with me, as I often plait small bits of my hair when I’m feeling anxious). I loved her interactions with her parents, who are also strong, kind, supportive, and loving – I think this is pretty unusual for fantasy! It’s nice to see nice families. The Labyrinth is part Wonderland, part Fae realm, and all danger. The tone of the book from this point, and the bizarre and scary creatures that Annalise meets, reminded me a lot of Chris Wooding’s Poison, which was one of my absolute favourites as a kid. Both books look at the dark and dangerous side of magic, requiring their heroines to find inner strength to survive the machinations of other-worldly beings, and both sit just on the right side of terrifying. The Spinner of Dreams is not in any way derivative of Poison, but they share a sort of overall feeling, and will probably sit next to each other on my shelf, whispering spooky things to each other. I don’t want to spoil anything about what happens in the Labyrinth, because watching it unfold had me on the edge of my seat, but I think it’s safe to say that Annalise has to learn a lot about how to accept herself, the same way she accepts everyone else, before she can triumph. She gains the guidance of some excellent friends (there is a gay fox gentleman, guys – he’s wonderful! ), and they help her to see that she can take control of her own life. This is exactly the kind of narrative I like – girls learning to accept that though they may be scared, they are powerful, and that it takes every facet of their being to become powerful. This is going to become a classic. I’ve already pre-ordered a hardback, and I’ll be recommending it for years to come (not just to middle grade readers – I think everyone should read it). It’s a hot candidate for best book of 2019 for me – and yes, I know it’s not even the end of January. Go pre-order it, please! Katlin Your review says everything I couldn’t because I was too busy weeping at the beauty of this book! Wow. This book. It’s the second by Reynolds that I’ve had the pleasure of reading and I absolutely loved it. I loved it more after I read the author’s note. This fantasy centers around Annaliese Meriwether, who is cursed at birth and fights to realize her dream of ridding herself of the curse and following her own destiny. There is so much to talk about this book, and I’m trying to do so without spoilers. Annaliese is a singular character. Brave beyond measure, selfless, and resilient, she learn Wow. This book. It’s the second by Reynolds that I’ve had the pleasure of reading and I absolutely loved it. I loved it more after I read the author’s note. Annaliese is a singular character. Brave beyond measure, selfless, and resilient, she learns so much about herself and allows that knowledge to develop empathy for others. I read so few neuro-diverse characters with such STRENGTH (Out of My Mind’s Melody springs to mind) and Annaliese’s struggles made her triumphs that much more gratifying. I cheered HARD for her. Her quest is full of twists and turns, and so many allusions to poems & books color her adventure along the way. The twist at the end was a surprise to me, and I loved that Reynolds trusts the reader enough not to be obvious or heavy-handed with important elements. Perhaps what I loved most of all about this book is what it can do for kids who don’t believe in themselves. Those who have suffered from trauma, those who have worry-thoughts” scattering their minds, those whose anxieties take over. Annaliese shows them that they, too, can reach their dreams. In my view, as a teacher, nothing is more vital to kids that both self-worth and the knowledge that people believe in them. Many thanks to the author for sharing an ARC with our #bookexpedition group! This beautiful fantasy story is told through the eyes of Annalise Meriwether, cursed at birth by the Fate Spinner. She is loathed, bullied, and feared by everyone except her loving parents, with whom she lives a reclusive life. Because of her past, her days are full of panic, anxiety, and self-doubt, but she dreams of changing her destiny. To do so, she’ll have to enter the world of the Fate Spinner and complete a quest Many thanks to the author for sharing an ARC with our #bookexpedition group! To do so, she’ll have to enter the world of the Fate Spinner and complete a quest filled with obstacles, including her own doubts. Along the way, she’ll meet her share of monsters (both internal & external) as well as those who wish to help her. This was a book I could SEE as I was reading. The characters, setting, and scenes were real to me, and the twists were surprising. I think the fantasy elements will appeal to fans of the Harry Potter world. What I loved most though, was Annalise herself. Courageous and persistent, she is a character readers will love and root for. Finally, don’t miss the equally important author’s note at the end; it made Annalise’s journey so much more important to me. In her second novel, K.A. Reynolds spins a deeply moving story about magic and anxiety, longing and fear, and the dreams that help us bridge the distance between where we are and where we would like to be. Annalise is a wonderful protagonist who readers can easily care and root for, while the world-building reminded me of some of my favorite folklore. This book would be a great way for parents to approach the topic of mental health with their children, specifically anxiety, which is addressed wi In her second novel, K.A. Reynolds spins a deeply moving story about magic and anxiety, longing and fear, and the dreams that help us bridge the distance between where we are and where we would like to be. Annalise is a wonderful protagonist who readers can easily care and root for, while the world-building reminded me of some of my favorite folklore. This book would be a great way for parents to approach the topic of mental health with their children, specifically anxiety, which is addressed with compassion and honesty in the story. I was lucky enough to have been sent an eArc of this book. I don't usually read fantasy but was intrigued. I loved how relatable the MC was. If you're a fantasy lover you will adore this book! The Spinner of Dreams is the second book by K.A.Reynolds, and proves once again her gift of weaving beautiful, dark fantasy (but not too dark for MG readers) with relatable emotional concerns, such as guilt, anxiety, fear, loneliness, betrayal, and grief. The description on the back says “The enchantment of Neil Gaiman meets the haunting wildness of Kelly Barnhill in this uniquely imaginative middle grade fantasy,” and I couldn’t have described it better myself. Like in so many beloved Madeleine The Spinner of Dreams is the second book by K.A.Reynolds, and proves once again her gift of weaving beautiful, dark fantasy (but not too dark for MG readers) with relatable emotional concerns, such as guilt, anxiety, fear, loneliness, betrayal, and grief. The description on the back says “The enchantment of Neil Gaiman meets the haunting wildness of Kelly Barnhill in this uniquely imaginative middle grade fantasy,” and I couldn’t have described it better myself. Like in so many beloved Madeleine L’Engle books, her characters must travel on quests through fantastical realms while also embarking on an intense emotional journey. However, in both The Land of Yesterday and The Spinner of Dreams, the heroine’s “real world” is just as fantastic as the worlds that they visit. Reynolds is gifted with a brilliant imagination and the words to share it with others. The worlds she creates are dreamlike, full of incredible imagery and symbolism. While The Land of Yesterday focused on a main character dealing with grief, The Spinner of Dreams centers on Annalise’s fears and anxiety - learning when to control them and when to embrace them as potential strengths. A huge thank you to the author for sending me an ARC of this book. Her previous middle grade novel, THE LAND OF YESTERDAY, was one of my favorite reads of 2018, so I was quite excited to get my hands on an early copy of THE SPINNER OF DREAMS. It was everything I had hoped it would be, and I cannot wait for it to make its way into the world in August 2019. Annalise Meriwether was cursed at birth by the Fate Spinner. She is a bullied, ridiculed, and feared by the people who live in her community, a A huge thank you to the author for sending me an ARC of this book. Her previous middle grade novel, THE LAND OF YESTERDAY, was one of my favorite reads of 2018, so I was quite excited to get my hands on an early copy of THE SPINNER OF DREAMS. It was everything I had hoped it would be, and I cannot wait for it to make its way into the world in August 2019. Annalise Meriwether was cursed at birth by the Fate Spinner. She is a bullied, ridiculed, and feared by the people who live in her community, and lives a reclusive life with her parents. Anxiety and panic are Annalise's constant companions, but she has a dream to be in charge of her own destiny. She must complete the Labyrinth of Fate and Dreams to have a chance to ask the Spinner of Dreams to grant her wish, but there are countless obstacles in her way. Annalise must fight the monsters both inside and outside of herself, and stay true to her heart despite all her doubts. What I loved most about this book is the way that a character with mental health challenges becomes a hero and finds her own power to change the world. So often, anxiety and panic are viewed in a negative light, but Annalise is able to use them to propel her toward her dream. She is resilient, courageous, and hopeful, and I love the message this sends to young people who grapple with similar issues. It's a book in which I saw myself many times, but I also saw what I could be, and felt inspired by Annaliese's strength. The fact that this book is written by an ownvoices author makes it especially important for young readers, and the author's note in the back illuminate some of the challenges with which she has had to deal. I think many readers will find comfort from her words, and knowing author has fought the monsters herself (I know I certainly did). I was fortunate to receive an ARC of this book and it has taken me a while to review it because I have. so. many. feelings. It's hard to put into words how magical and complex but also completely relatable this book is. It has the immediate familiarity of all the best fairy or folktales, while also being completely original, and that is an incredibly hard needle to thread. K.A. Reynolds weaves together a fantastical story full of vivid imagery and metaphors that readers of all ages can appreciate I was fortunate to receive an ARC of this book and it has taken me a while to review it because I have. so. many. feelings. K.A. Reynolds weaves together a fantastical story full of vivid imagery and metaphors that readers of all ages can appreciate. She never talks down to her young readers and that is of utmost importance in my opinion. She is right there with them. Right there with her main character, Annalise, on her quest to overcome her curse as she struggles and triumphs and sometimes fails in an imperfect and scary world. A world that seems stacked against her. The mythology of enchantresses of dreams and of fate set against one another create an epic backdrop, ripe for conflict both external and internal. This story doesn't shy away from the hard paradoxes of life but makes the reader feel that there is hope nonetheless. And that is a story that some readers desperately need. What a fantastic and enchanting story! I was able to read this book early courtesy of an ARC sent by the author/publisher. I first saw this book a few months ago and I thought the cover was the most beautiful cover I have ever seen. I know you aren't supposed to judge books by their covers but how can you not think a beautiful and enthralling story lives behind that cover?? Annalise is one of my favorite main characters I have ever read. She is fierce and thoughtful and fair and she does all she What a fantastic and enchanting story! I was able to read this book early courtesy of an ARC sent by the author/publisher. I first saw this book a few months ago and I thought the cover was the most beautiful cover I have ever seen. I know you aren't supposed to judge books by their covers but how can you not think a beautiful and enthralling story lives behind that cover?? Annalise is one of my favorite main characters I have ever read. She is fierce and thoughtful and fair and she does all she can to protect her family, her town, and herself. I think all girls need a protagonist like Annalise. If you like fantasy, rival sisters, magic hands, talking/monocle wearing cats, friendship, labyrinths and dragons this is the book for you. It was all done in such a smooth and believable way, and I think that shows that the author has a proficiency for writing these kind of fantastic stories that are for middle grade readers. I know I would have loved this book as a young reader, and I can't wait to share it with the students at my library when it is released in August! In her second book, Reynolds has created a fantasy world filled with mystical beings, evil curses, and real-world truths. Readers of all ages will devour the two tales expertly woven together in this book. The first is a quest: blackberry-haired Annalise and her animal friends must fight their way through a magical labyrinth to break the curse she acquired at birth. The second tale is the internal story of Annalise grappling with anxiety and self-doubt to realize and accept that she is worthy of In her second book, Reynolds has created a fantasy world filled with mystical beings, evil curses, and real-world truths. Readers of all ages will devour the two tales expertly woven together in this book. The first is a quest: blackberry-haired Annalise and her animal friends must fight their way through a magical labyrinth to break the curse she acquired at birth. The second tale is the internal story of Annalise grappling with anxiety and self-doubt to realize and accept that she is worthy of both love and her dreams. This is a book for dreamers -- encouraging, empowering, beautiful. I cannot recommend it highly enough. If it was *just* a gorgeously atmospheric, richly drawn fairy tale for the contemporary world, that alone would put it at the top of my favorites list. And Annaliese's story is all that, wrapped in a heroine's journey to break a curse she was born with, one that has her entire town shunning her. However, The Spinner of Dreams is also a safe place for neurodiverse kids--and adults. Annalieses's anxiety doesn't define her. Instead, it's simply part of who she is as she shapes her ow This book, guys. However, The Spinner of Dreams is also a safe place for neurodiverse kids--and adults. Annalieses's anxiety doesn't define her. Instead, it's simply part of who she is as she shapes her own path through the Labyrinth, and makes her own destiny. I was given an arc for review via edelweiss. I was initially interested in The Spinner of Dreams because it featured a main character with intrusive thoughts. I thought it was a YA before I requested it, but it turned out to be a middle grade. I was a little hesitant going into it, but I’m so glad I read it. It was completely worth my time. This story follows Annalise Meriwether, who everyone believes is cursed. Her parents love her but that does little to deter the cruel actions of the people in her town. I absolutely loved this book. The writing was beautiful, the story was entertaining, and Annalise is a character I loved. I think many readers will be able to relate to her and her feelings. I rated it four out of five stars simply due to the fact that I didn’t personally find the first chunk of the novel very engaging and felt it was a little boring. However it really did pick up later on. This book was beautiful and I loved the neurodiverse protagonist, Annalise. She was wonderful, not despite her flaws, but because of them. I wept at the end of the book and the note from the author. Believe in the Spinner of dreams, because she believes in you. K. A. Reynolds is a Winnipeg, Canada native who lives for Monty Python, old dead poets, ushering creepy crawly things with numerous legs out of houses, and writing dark and lovely things for children. Despite her innocent appearance, she has been described on more than one occasion as the following: strange, grim, fierce book fancier, cat, lover of the fantastic, indulger of the macabre, and more K. A. Reynolds is a Winnipeg, Canada native who lives for Monty Python, old dead poets, ushering creepy crawly things with numerous legs out of houses, and writing dark and lovely things for children. Despite her innocent appearance, she has been described on more than one occasion as the following: strange, grim, fierce book fancier, cat, lover of the fantastic, indulger of the macabre, and more often than not, witch. Her debut MG Fantasy, The Land of Yesterday, debuted with HarperCollins 7-31-18, with a second MG Fantasy, The Spinner of Dreams, to follow 8-27-19. K.A has been published in several poetry journals and could wallpaper the universe in all the unread poems hidden on her computer. When not caring for the elderly as a certified nursing assistant, or buried under a mountain of mismatched socks, she can be found enjoying the wilds of Maine, where she currently resides with her family. She is represented by a superhero otherwise known as Thao Le of SDLA.